Swipe, a Pune based firm has launched it’s new invasion which is slotted between the tablet and the smartphone segment as,” Swipe phablet F1” in the Indian market. Swipe is a telecom service provider which is progressively empowering its compendium of delivering Android based gadgets in Indian market. As, Technology is changing at a rapid pace world’s biggest giants in telecom sector are compelling to role over with new invasions. Swipe phablet F1 is a Dual Sim (3G + 2G) Smartphone which runs on Android 4.0(Ice Cream Sandwich) operating system and is powered with 1 GHz, MTK 6575 processor, which makes it run more efficiently. Swipe Phablet hold a descent display of 5-inch WGVA Capacitive,Multi-Touch screen with 800×480 pixels of screen resolution and as far it’s body dimensions is concerned it has 145.0×80.0x11.4 mm in dimensions. In terms of memory, Swipe Phablet offers 4 GB of in-built memory which can be easily extendable upto 32 GB as Swipe Phablet support T-Flash Card. Dealing with it’s Camera, Swipe Phablet is incorporated with both the camera’s, Swipe Phabelt offers primary camera with Flash (5 MEGAPIXEL) at 2592×1944 Pixels and the secondary camera at 0.5 MEGAPIXEL (VGA) at 640×480 Pixels. On this Occasion, Founder and CEO of Swipe Telecom “Shripal Gandhi” stated, “We see Gujarat as a critical market for our products. Our strength is in our innovation in technology products & value proposition & with providing customer with an affordable world class technology and offer delight in after sales as well. 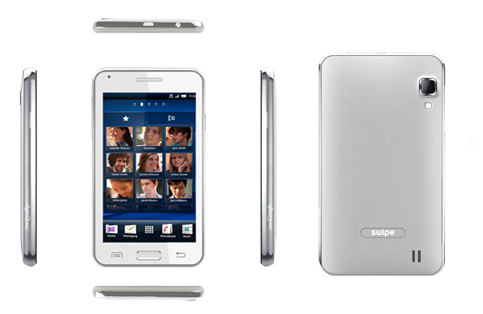 Other features of Swipe phablet, 3G support, WiFi, Bluetooth, micro USB, GPS and 3.5mm audio jack. Swipe Phablet weighs 120 grams and is 11.4 mm thin, make it more easy to carry. To power it up, Phablet is incorporated with 2500 mAh of capacity. Swipe is also offering a flip cover and two battery for a limited time period. Swipe Phablet falls under a price tag of Rs, 8,990.